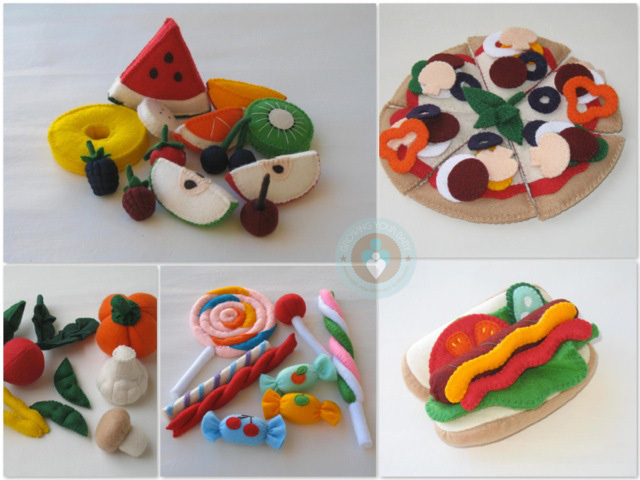 Home » Yummy Felt Food from Pachom! Located in Montreal, Canada, Pachom creates the most amazingly yummy looking felt food! The perfect accessory to any play kitchen or for your little budding cook at home. Felt food sets can be mixed and matched to make the most amazing dishes. The sets are all so varied, and include a breakfast set with pancakes, syrup and butter, 2 sausages, 2 slices of bacon, 2 fried eggs and even a strawberry; a cut fruit set is also available, and comes with apples, watermelon, berries, pineapple and kiwi, just to name a few! 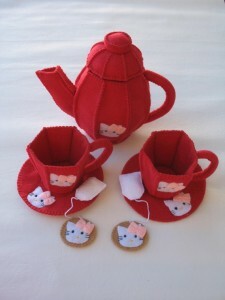 For little Hello Kitty lovers there’s a sweet tea service with two cups, a tea pot and two Hello Kitty tea bags. And for those with a sweet tooth there’s a felt candy set, dessert set and even felt pop tarts! Awesome! I think one of my favourites might just be the plain pasta set. The perfect base on which to add all sorts of other felt bits to make unique pasta dishes…veggie pasta, fruit pasta or maybe even breakfast pasta! Felt food is a great open-ended toy and will lead to hours of creative fun in play kitchens, real kitchens and even the living room!